But given Hanks’ struggles that doesn’t mean you should role your eyes when I tell you that in Captain Phillips, Hanks delivers his best performance in years. 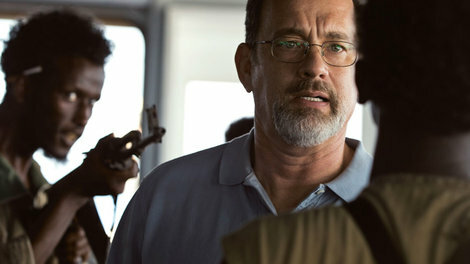 As the captain of a freighter overtaken by Somali pirates, Hanks plays an ordinary man thrust into extraordinary circumstances and reminds you what this two-time Oscar winner is capable of. On their way around the horn of Africa — to ironically deliver, among other things, humanitarian aid supplies — the crew of the Maersk Alabama are pursued and hijacked by a small group of machine-gun toting pirates. Captain Richard Phillips instructs his crew to hide below decks, leaving essentially himself to deal with the intruders, who immediately demand the boat be taken to Somalia for ransom. Finding the ship intentionally scuttled, the pirates then demand at gunpoint that Phillips lead them to the rest of the crew, who can repair the boat and make harbor. With very few options, Phillips does what he can to buy time, ultimately finding himself alone on an enclosed life raft with his captors being pursued by the U.S. Navy. While the audience stays mostly tethered to Phillip’s point of view, the camera pulls back just enough to let us know that the pirates will be stopped before reaching the coast, one way or another. Directed by Paul Greengrass, who helmed the second and third Matt Damon as Jason Bourne films, Captain Phillips is one part nail-biting high-seas adventure and one part tragic social commentary. The siege of the Maersk Alabama is a breathtaking piece of action directing, possessing all the white-knuckle tension of a blockbuster aerial dogfight despite consisting of a freighter and skiff bouncing around on the ocean waves. Greengrass’ pirates, culled from non-professional actors, are not swashbuckling rogues but are instead an almost uncomfortably realistic portrayal of third-world poverty. They have no choice but to live this life of maritime crime and as their situation grows more hopeless, their choice is but to continue on or die trying, infusing the plot with an unpredictable danger and tension that Greengrass keeps running high but never boiling completely over. The movie builds on a relentless crescendo, beginning small and following through as both Phillips and the pirates reach wit’s end and are pushed to ever-more-desperate steps. My main complaint would be that the personalities of the four “vilains” are unfortunately archetypal — the innocent teenager in over his head, the loose-cannon, the talkative leader with his finger on the trigger — but their portrayals keep their heads above water and avoid dipping into cliche or caricature. Captain Phillips is a taut and highly emotional tale of survival on the high seas, elevated further by its roots in the real world. It shrugs off the unnecessary pageantry of more fictitious films like Hanks’ own Castaway, instead focusing on the inherit drama of normal people facing unimaginable dangers. *Captain Phillips opens nationwide on Oct. 11.